Ever since 1976, February is observed as the “Black History Month” in America. While the black community of U.S. has never ceased to be a victim of racial profiling and prejudice, Three years ago, the #BlackLivesMatter movement was born after the unwarranted and brutal deaths of Eric Garner, Michael Brown, and Trayvon Martin, stemming from decades of disregard and injustice. As the movement took root to defend the lives of the Black community and speak up against the bashful injustice and incompetence of the forces, it planted seeds in the minds of the artists. From those seeds sprung the images of empowerment, hope, fear, and outrage. 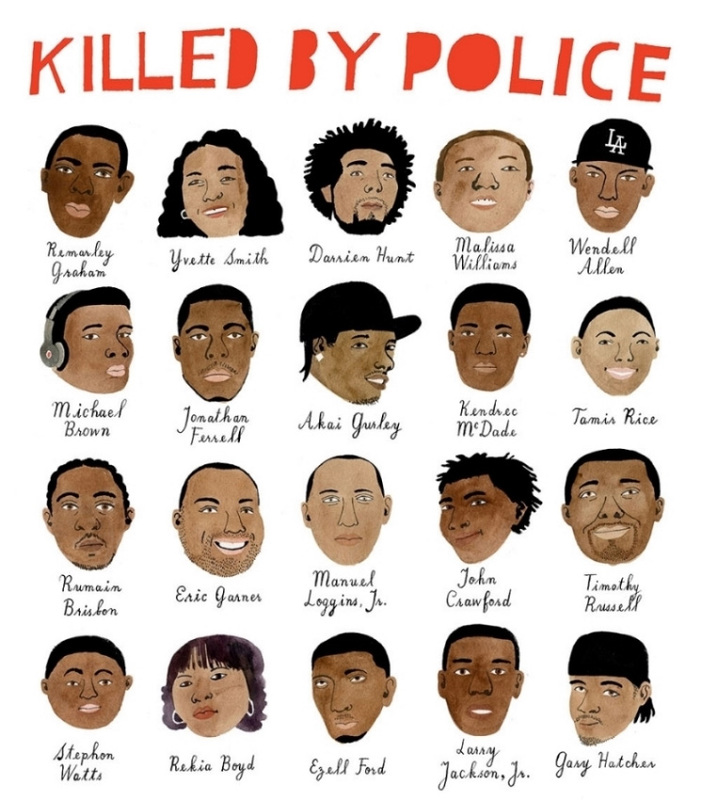 Al Jazeera illustrator Dolly Li was a resident of Oakland during the #BLM protests in the aftermath of the unfortunate Ferguson incident. One night, she stood facing the riot cops, petrified and questioning how much worse the situation could have been if she were a young black man, facing an unyielding police line, demanding justice. She felt an emotional pull to create the imagery, diligently calculating and planning out every small detail, from choosing a suitable color palette to portray a suit of silhouettes to balancing out an exceptionally charged color, such as red. #BlackLivesMatter cannot simply be condensed down to a few heart-wrenching words on a piece of paper, intended for an American audience fully proficient in English; we need so much more than that as a society. For an artist who seeks to empower different cultures and embrace diversity, this striking illustration of Martin Luther King Jr. by Bedelyn Dabel perfectly sums up everything the #BLM campaigns have been trying to convey; Black people have dreams, aspirations, and hopes just like their fairer counterparts, until they were all ruthlessly trampled upon. 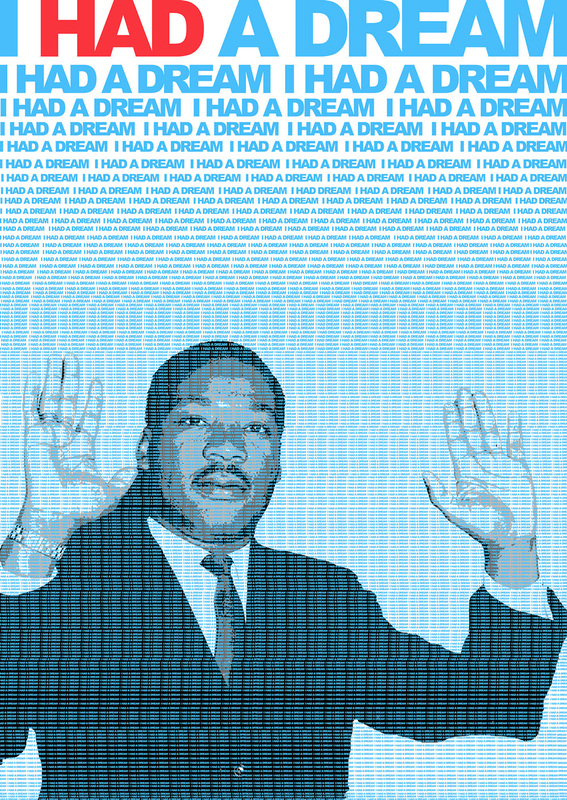 In an attempt to look back at the Civil Rights Movement and to MLK himself and compare it to the brutality of today, the illustration draws upon the public speech delivered by the American civil rights activist Martin Luther King Jr., named “I have a dream”, in which he called for an end to racism in the U.S. and demanded civil and economic rights. Did his dream die with him? Artist Alim Smith protests against the supposed quandary of whether “all lives matter”, versus taking up the cause for the preservation of ‘black’ lives specifically. Smith argues that “All” lives aren’t endangered here, while Black lives are being mass targeted ruthlessly. 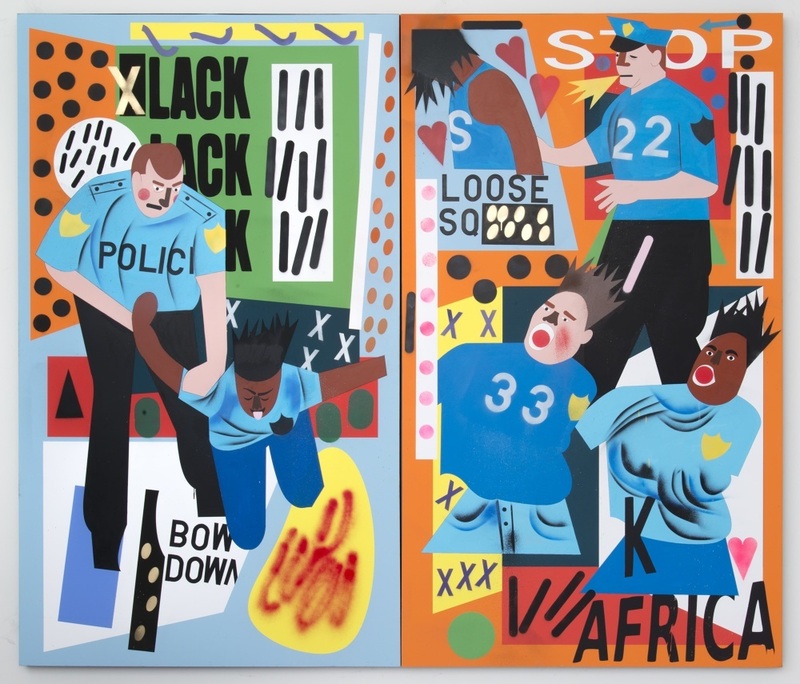 Artworks for #BLM, like the one above, give a visual identity to America’s historic bigotry against its black residents promoting stereotypes of danger, criminality, and violence. 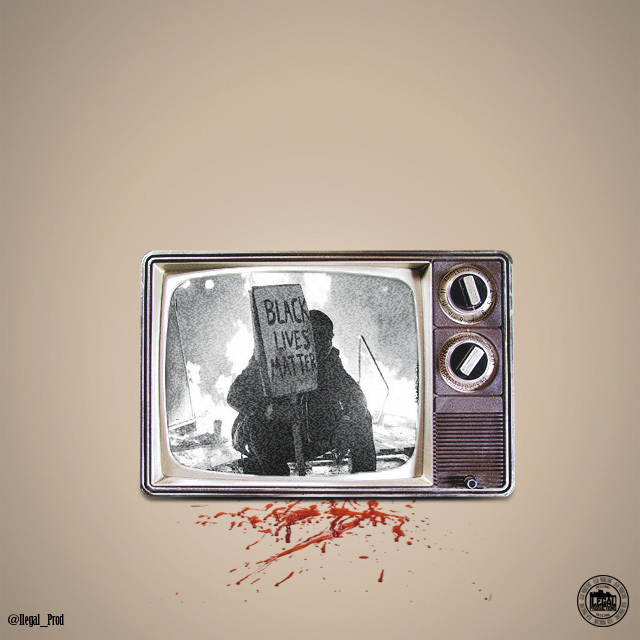 This potent illustration by Jamal Tyler Nyanyo perfectly sums up everything the #BLM campaign seeks to promote. Black people are human, yet they are judged, ridiculed, abused, mocked, and their innocent lives taken in vain. This Ad tears at the heart by depicting everything the Black community feels and yearns for others to see. 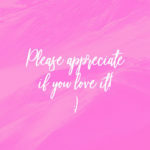 The monotone color palette serves to depict the severity of the message and the hand-lettered typography perfectly echoes the heart-felt words of the message. 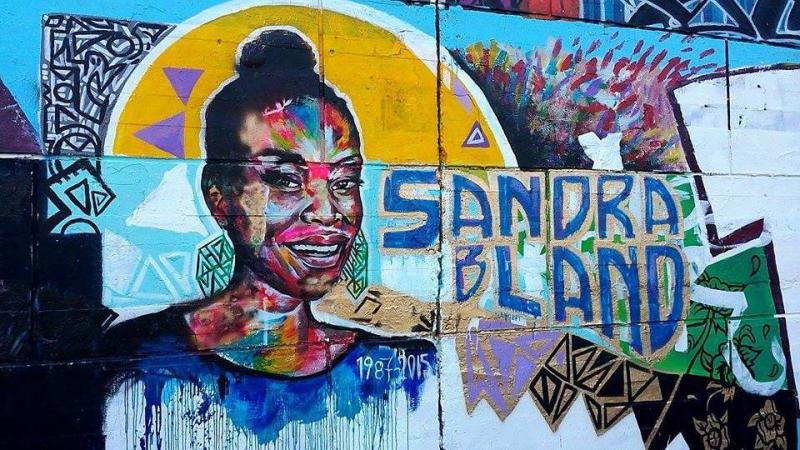 In order to support the #BlackLivesMatter movement as a whole, and honor the spirit and life that was taken too soon, artist Allan Andre painted this inspiring mural of Sandra Bland in Ottawa, Ontario, Canada. The heart-wrenching mural is painted on a public and legal graffiti wall, which was noted for an incidence in which the phrase “Black Lives Matter" was erased off it by a bunch of graffiti artists who couldn’t stand a socially relevant message covering up their work. While a simple message wasn’t construed as art by them, this beautifully painted mural offers a sharp retort. This deeply meaningful illustration by Nadia Hannah incorporates driving slogans and heart-rending questions that challenge everything wrong with the world today. 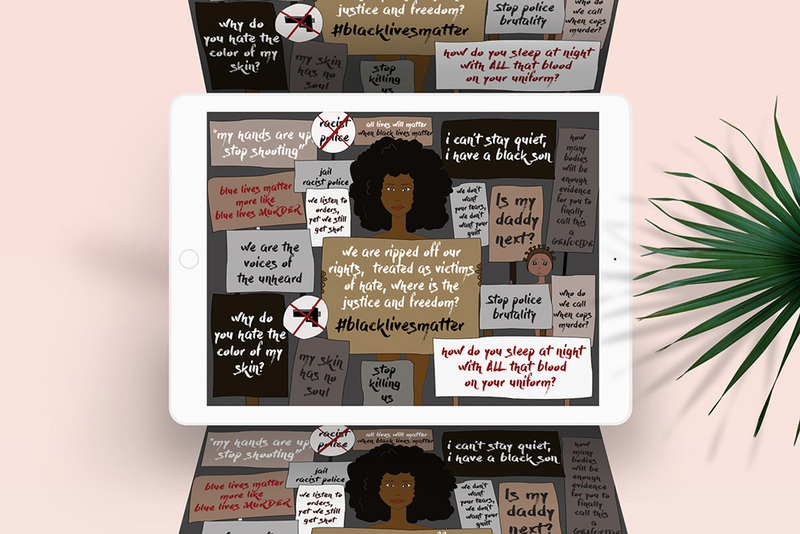 The illustration outlines one of many rallies for the #BLM campaign viewed on a tablet device, with banners inscribed with powerful slogans held up high. Artwork like this allows people across the globe to earnestly connect in moments of grief, no matter how fleeting the connection is. In 2014, Chris Kindred was a college student when he was eventually depleted of the emotional strength to attend every demonstration around his campus in Richmond. 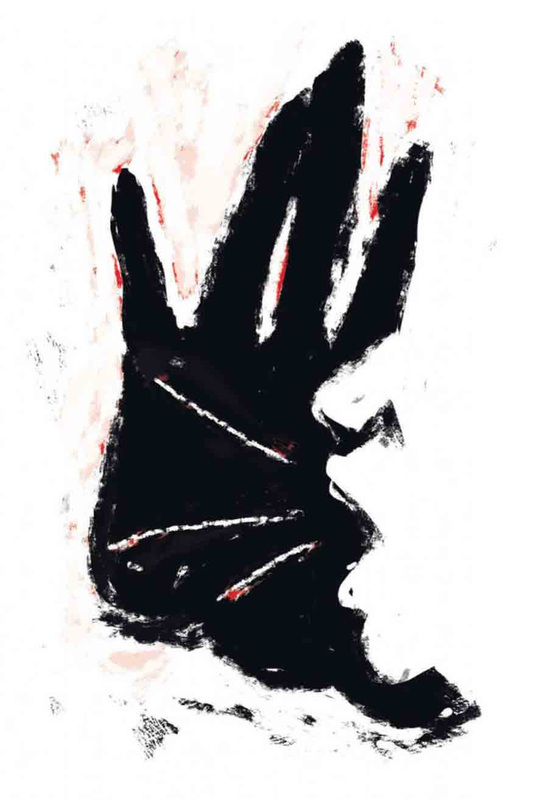 In an attempt to empower and uplift those on the ground, he designed “speak up!” which fueled him with the energy he needed to contest racism “at face value at every single turn.” The charcoal illustration of a hand, ringed with splatters of blood, with the negative spaces forming an open mouth speaking out, is a call to stand against justice instead of cowering in fear. 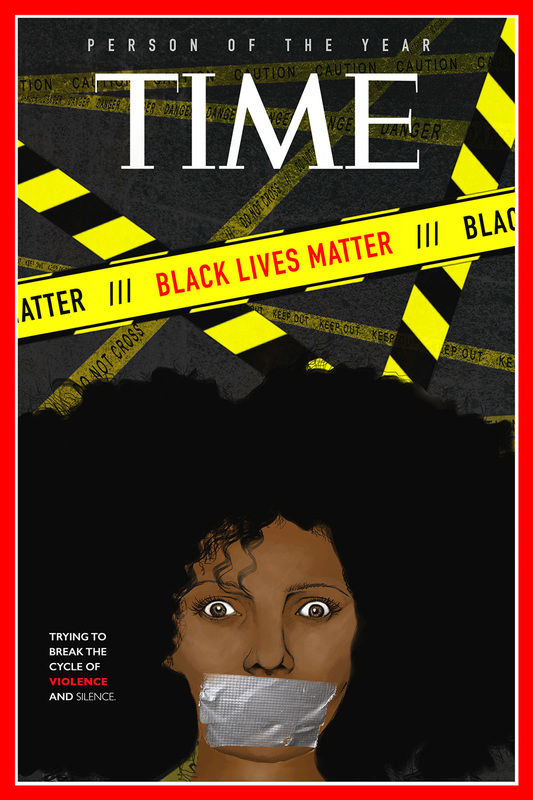 Artist Jada Cash designed the cover for Time, in which she attempted to “break the cycle of violence and silence”. 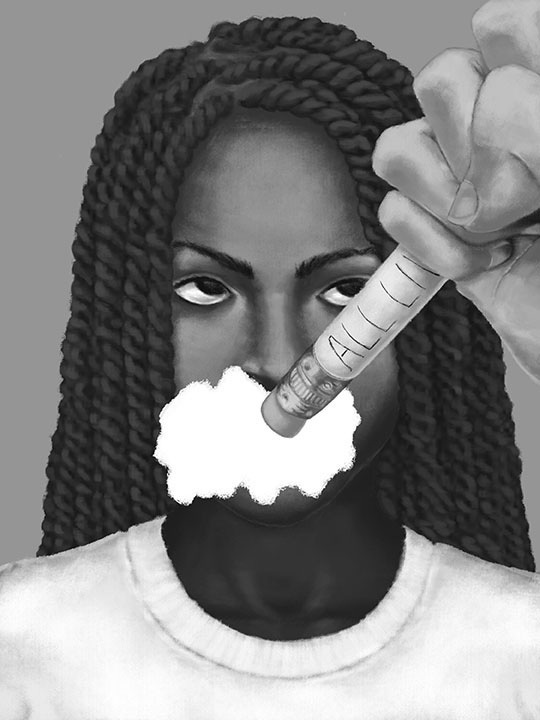 The image of a black woman, with her mouth covered in duct tape, portrays the helplessness of the Black community when it comes to safeguarding their lives and the right to speak out. The slogan “Black Lives Matter” is highlighted in red over a yellow barricade strip to command immediate attention and to depict the gravity of the message. In addition, the chain of barrier strips over the background, insinuates at the proliferation of crimes committed against the Black community. Tomashi Jackson plays a vital role in Simone Leigh’s “Black Women Artists for Black Lives Matter”. She is involved in plenty of street and political activism. For her project titled “Dajerria”, she studied Josef Albers’ writings dating back to the early 1960s, and attempted to conjecture comparisons to the civil rights movement. All the images featured over the project are drawn from the landmark court decisions and police-brutality cases from the civil rights movement, while the color palette is all albers. For instance, the “McKinney Pool Party” case alludes to the Texas pool party incidence in 2015, where a bikini clad black teenage girl was restrained on the ground on account of racism. 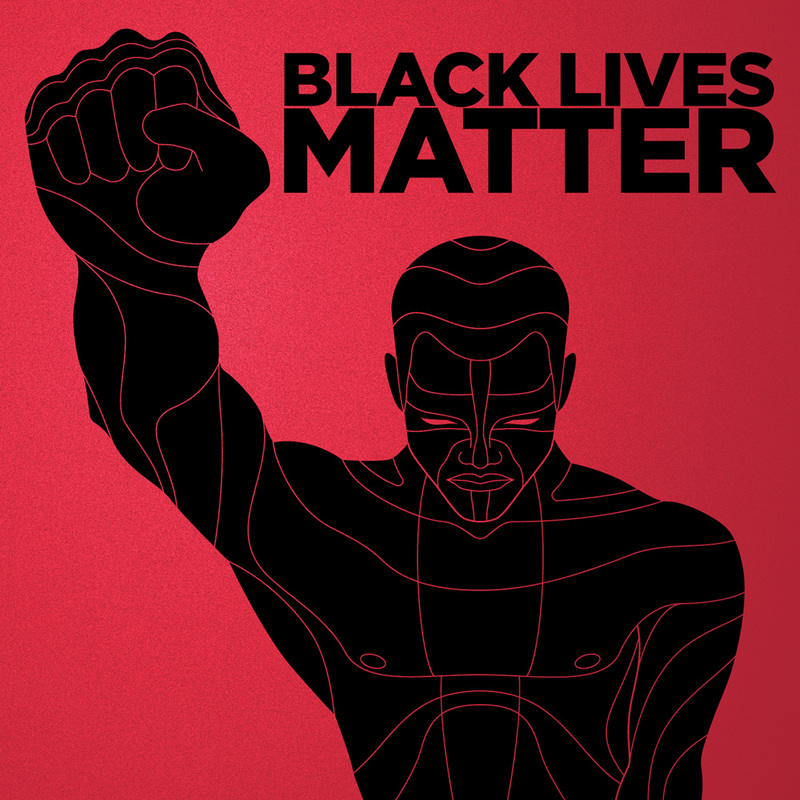 The potent image by Mariosupa illustrates the anatomy of a black man, with fist held high in a gesture of acknowledgement. The image is further reinforced with the slogan, Black Lives Matter. 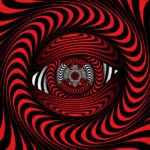 The contrast of red and black seeks to lend gravity to this illustration and delineates the fact that white or black, we are all made of the same material! In this strong illustration by CorDarius Curtis, the artist twists the classic “why did the chicken cross the road” jest to portray a stark reality. The illustration conveys an important message; racial profiling isn’t a joke! 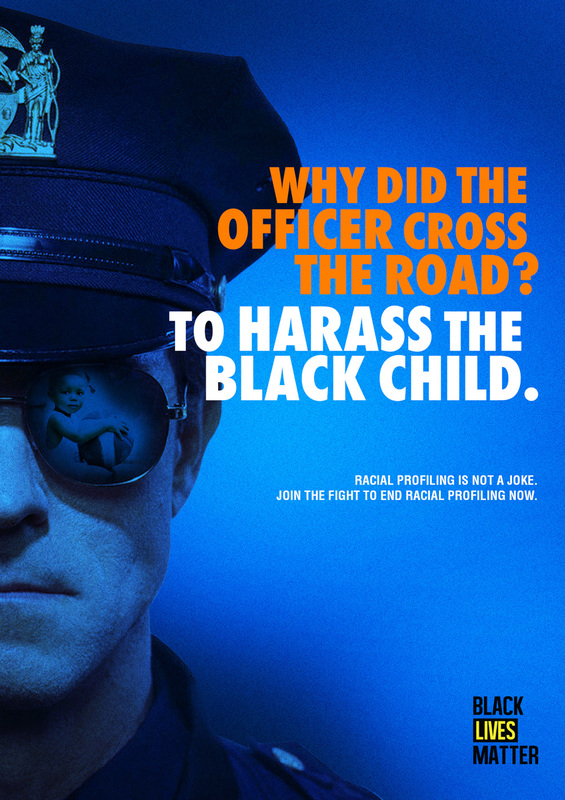 The AD is a direct protest against the brutality of our forces and their prejudice against their black charges. The message is further strengthen by the reflection of a black innocent child in the police officer’s sunglasses! 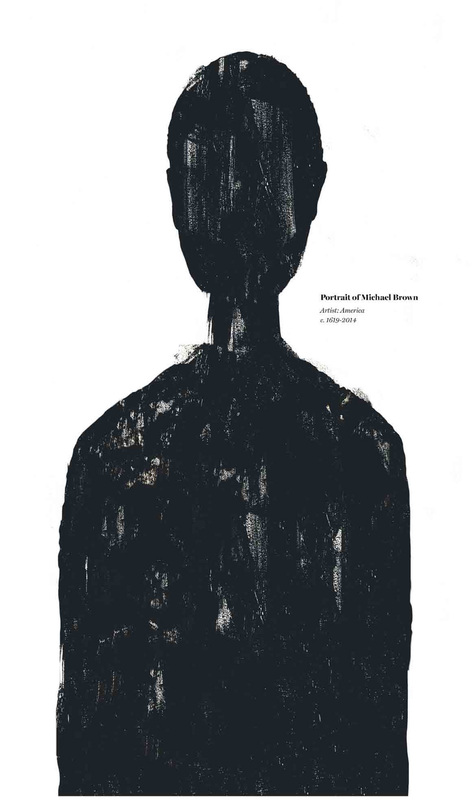 The “Portrait of Michael Brown” created for the Cleveland Plain Dealer is an illustrated opinion piece by Andrea Levy. The artist was so deeply impacted by the police shootings that in her own sense of endless futility, she realized she couldn’t even begin to image it from the perspective of the victims. After all, how could she possibly relate? In a deep moment of melancholy, Michael Brown became a poster child for her! She aspired to capture a sober observation with this image, which was a “lack of identity”. The image is a silhouette with a few accompanying words. A portrait of a young black man in America for whom the general public doesn’t even bother to define context, history, or features, unless there is controversy, crime, or fame involved. The crude outline looks intimidating at a glance, but is actually the depiction of our society’s most susceptible and vulnerable citizen facing overwhelming odds. This powerful image by Craig Wards immortalizes a dark message in white text to amplify the meaning of the deep words. 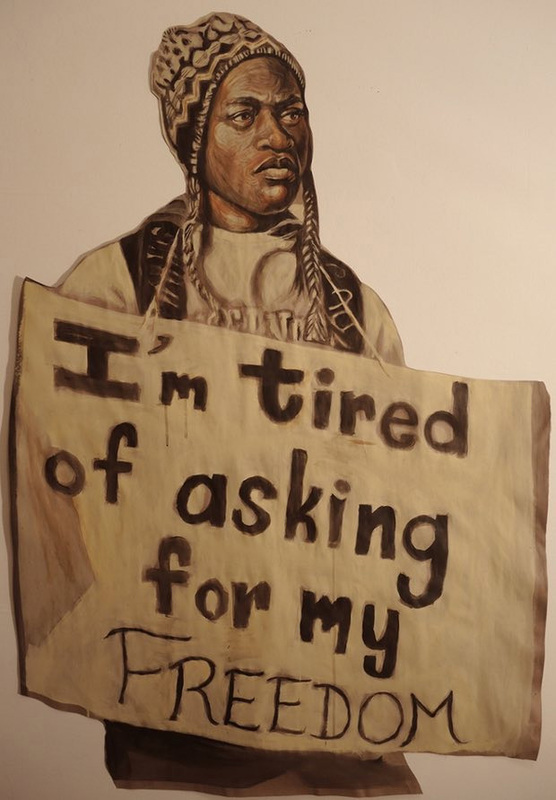 The crude lettering and the melancholy palette directly reflects the condition of one of the most vulnerable communities in the U.S; the African Americans. Ever since the #BLM campaign sprung up, another campaign titled “all lives matter” has been clamoring to take its place. The illustration by artist Rohanie Lucero depicts a pencil-eraser, engraved with “All Lives Matter”, wiping away the one last hope for the Black community to stand for justice and a place in society. 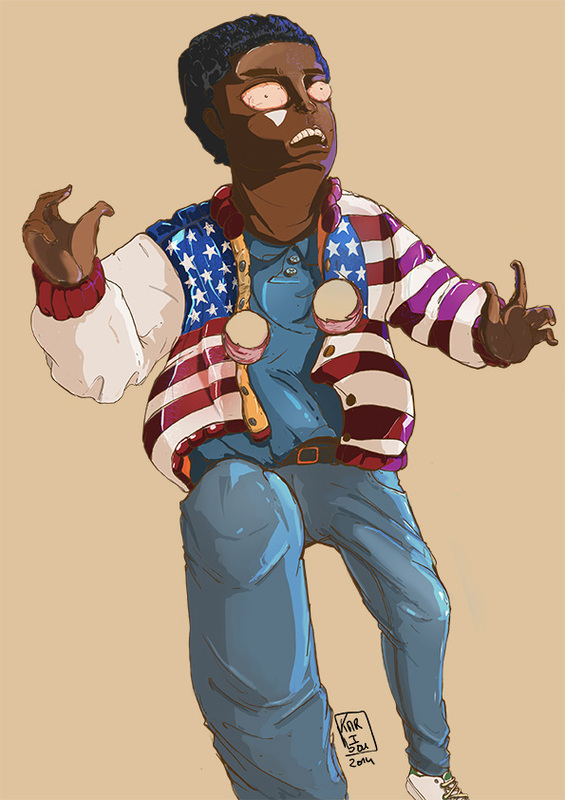 In order to portray the fact that African Americans are true patriotic Americans in spirit, this powerful illustration by Faysal Boukari, represent a man with his eyes gouged out, apparently in an act of violence, clad in a star spangled attire. No matter how hard the prejudiced white community wishes to alienate their black neighbors, the Black community is truly American in essence. The powerful range of T-Shirts by Hakeem Dixon proudly flaunts the slogan, “Black Lives Matter” over the front, and a separate excerpt from the diary of a black victim on the back. The heart-wrenching incidents incurred by a common Black person in America, ingrained deeply in his daily routine, is a true eye opener. A brilliant move by Hakeem Dixon, in an attempt to make their sorrows known to all and sundry and to open our eyes to the everyday woes of the Black community. The potent illustration by Lincoln Rivera depicts a woe-stricken Black man, sitting against a fire-blazed backdrop, asking for help and recognition by holding up a “Black Lives Matter” banner in his hand. The illustration articulates a strong message; our Black Community is slowly extinguishing and each fallen hero is a silent plea for mercy. The illustration by the artist Raphael Jiya articulates more than what meets the eye. 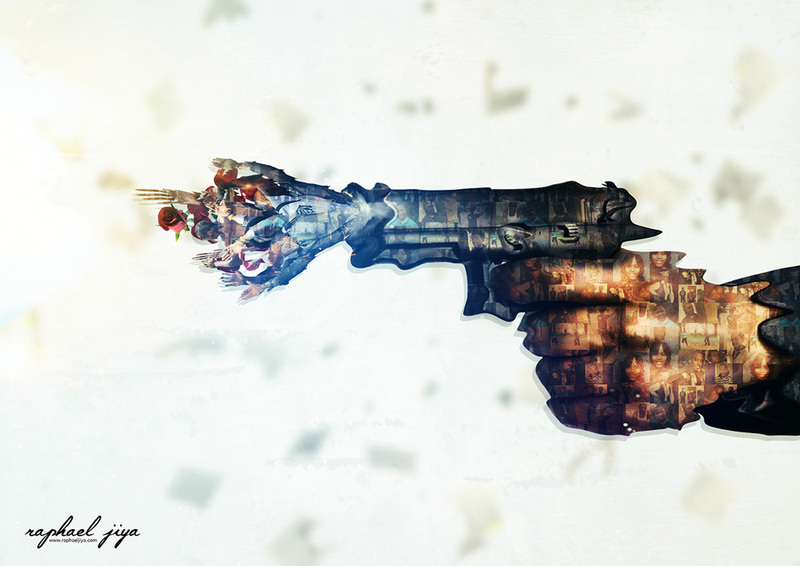 The hand shooting the bullets and the gun itself is made up of the images of the fallen black heroes. Instead of bullets, the gun is churning out the people it has brutally murdered. 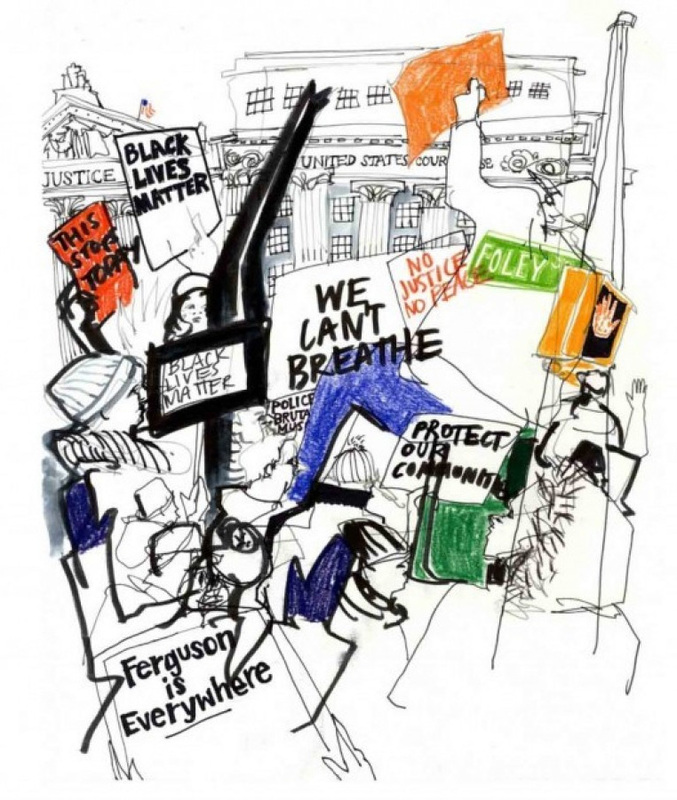 After a grand jury refused to impeach the NYPD officer who killed Eric Garner, artist Carly Larsson drew an image in New York City’s Foley Square, to capture the energy and mood and record the ongoing protest on location. She even immortalized the protest banners and slogans, and the outrage of the mob to perfection. In reaction to Trayvon Martin’s death and the inability of the state to indict his murderer, Tes One felt it his duty to suppress any hesitation he was personally feeling and call out the injustice. 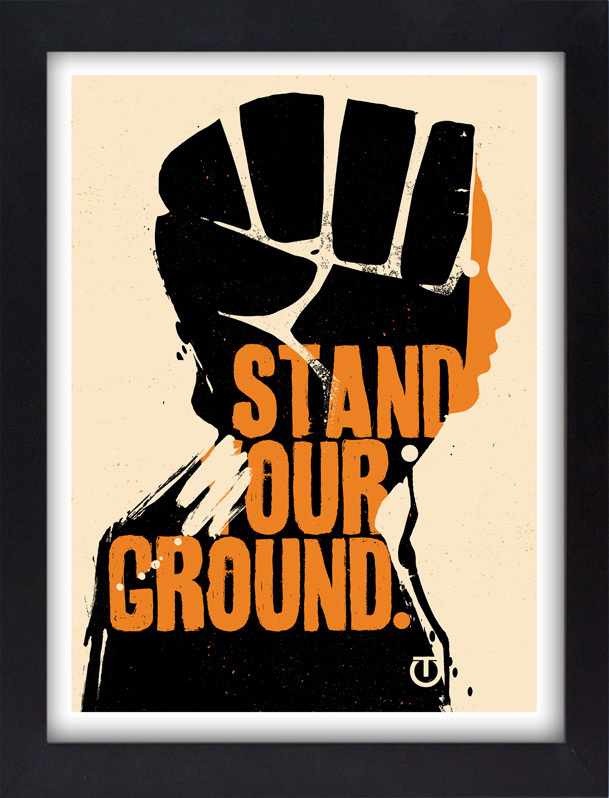 The message, “Stand Our Ground” is all that mattered. This was the first time the artist felt deeply compelled to leverage his art to address a social issue such as this one publicly. 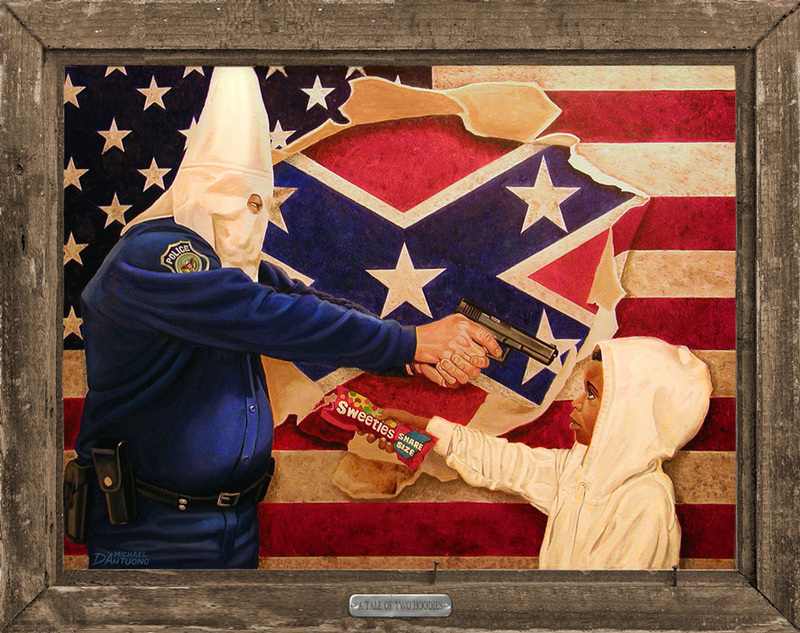 Inspired by the Trayvon Martin case and the utter ruthlessness of it, this painting, titled “A tale of Two Hoodies” by the artist Michael D’Antuono, denotes the travesty of racially profiling innocent and guilt free children, by illustrating an exchange between two hooded individuals; a kid offering a bag of sweeties and receiving bullets in exchange by a nameless police officer, against a backdrop set by the American flag. 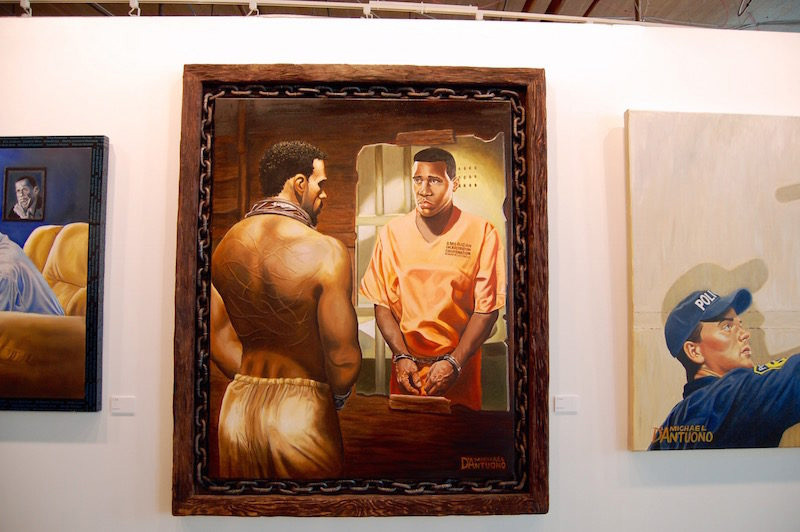 The Painting is a perfect depiction of how present-day prejudices affect policy! 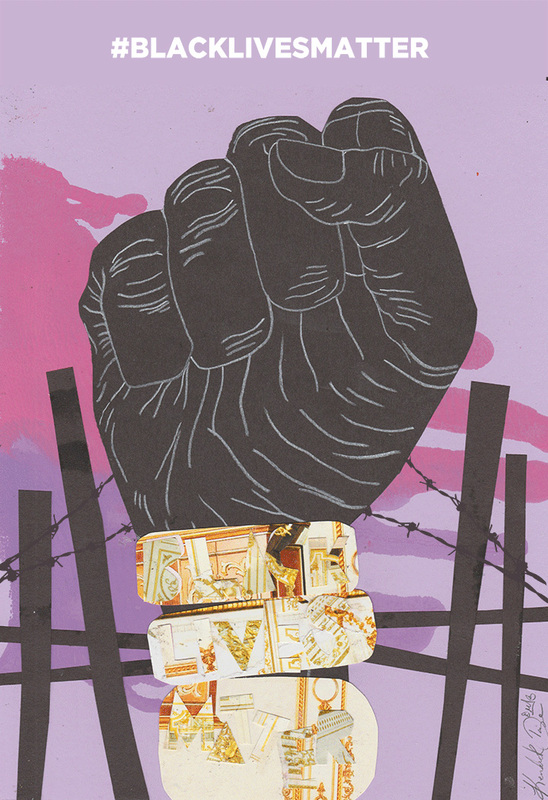 The powerful illustration by artist Kendrick Daye depicts a black fist, chained to barbed wires and held by shackles. The Slogan of “Black Lives Matter” is inscribed over the shackles, with the lettering denoting more bounds and restraints. 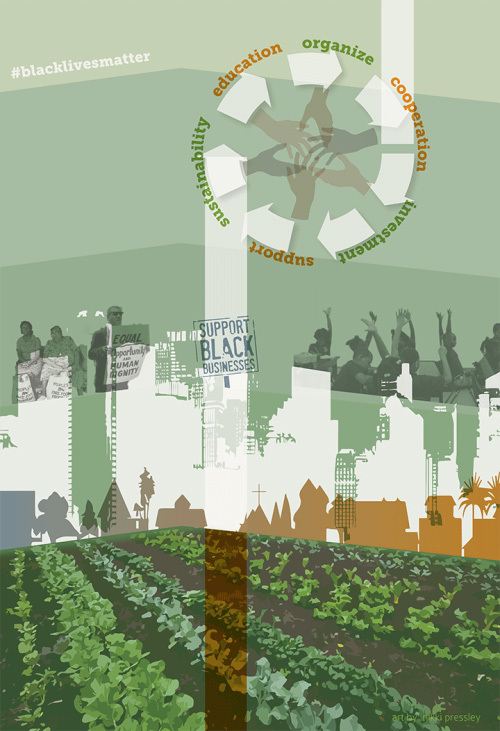 The Black Futures Month uplifts the right to employment and housing for all African Americans residing in the U.S. 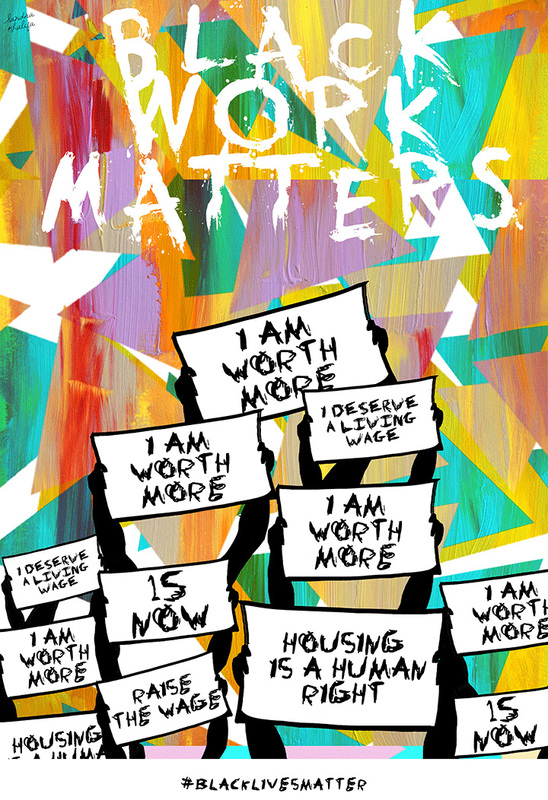 This illustration by the wonderful artist Sandra Khalifa offers another perspective to the #BLM campaign by representing a rally echoing an important fact; Black lives are worth more! Shelter and employment are basic human rights and the Black community shouldn’t be deprived of them at any cost. 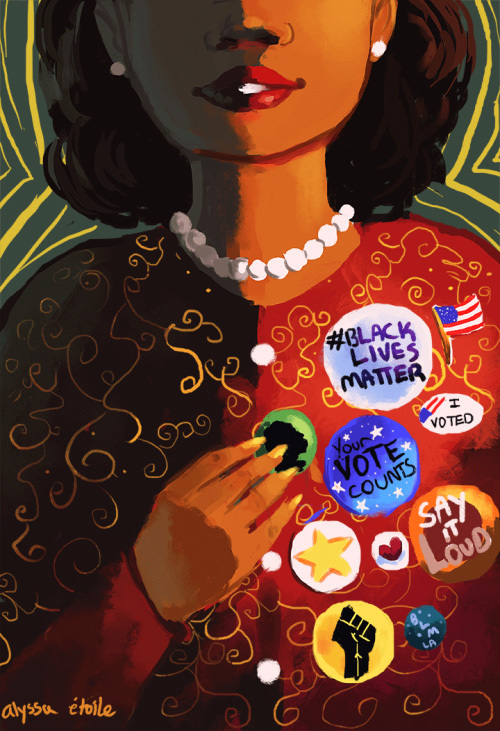 This powerful illustration by the artist Alyssa Etoile contests the right to vote for the African American community of the U.S. As legal citizens of the U.S, their votes count and their voices matter; something the white community often fails to remember. Nina Chanel Abney is renowned for creating abstract paintings that scrutinize and question the relationship between the minority communities and the police officers, and will continue to do so until she sees progress. Her works talk about the “now”, and will continue to be until her dream of U.S becoming a safe haven for the black community, is realized. 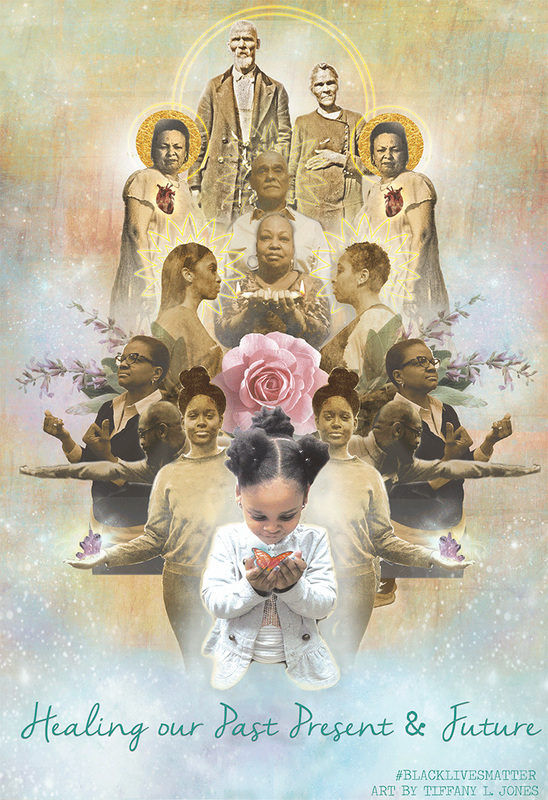 The wonderful painting by Tiffany Lenoi Jones depicts the black community in a moment of peace and reprieve, in which they have the leverage to heal their past, present, and future, and nurture the wounds left over by decades of prejudice. 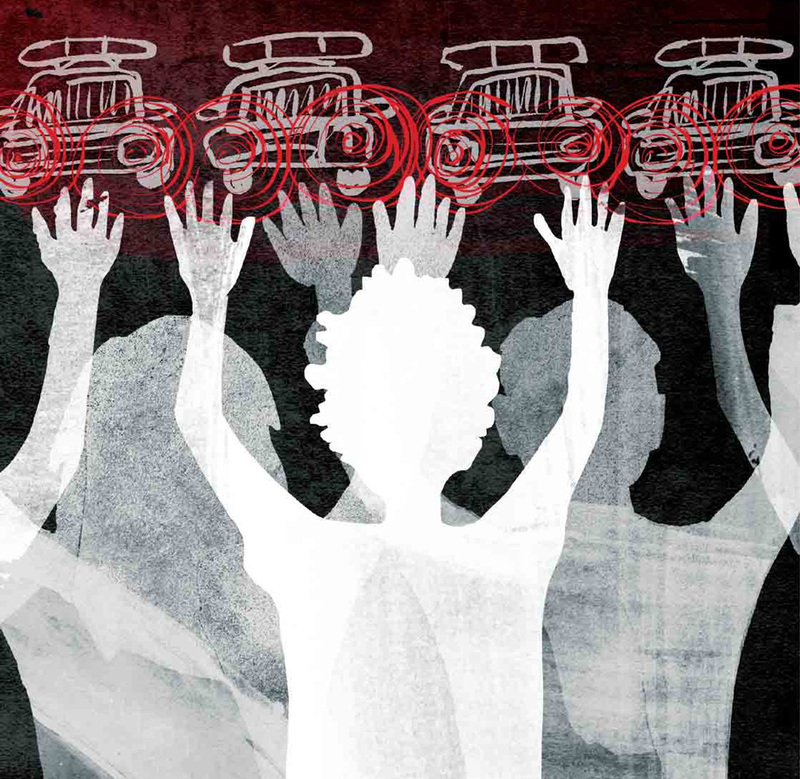 In the wake of Alton Sterling’s unfortunate death, people all over the country mourned another in a seemingly-never-ending series of unwarranted police shootings of the black community. Throngs took to the streets in protest, while others grieved and reflected in solitude. 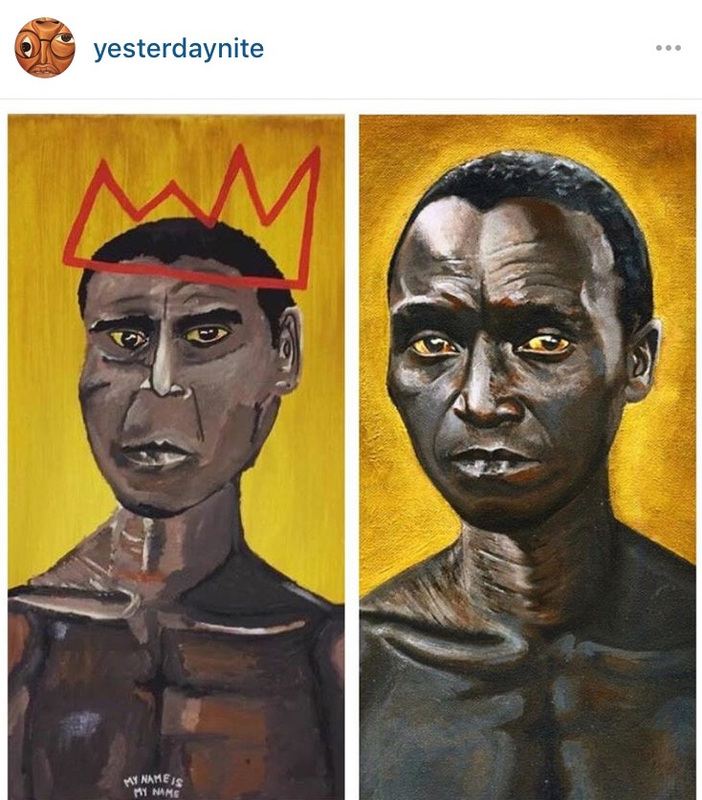 Artist Langston Allston , on the other hand, started painting. Allston hitched a ride to Baton Rouge in Louisiana, when he heard about Alton Sterling. There, he picked up a paintbrush to play his part in the city’s healing and anguish, and commemorate a striking and heart wrenching chapter in history. 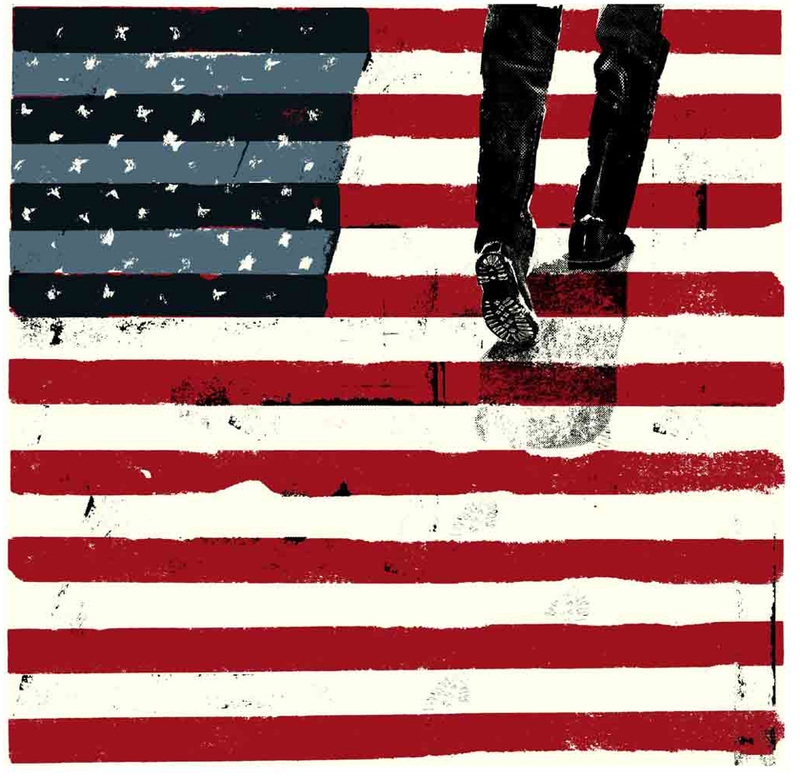 Artist Alexandra Svokos denotes in his illustration how it is like to be a Black man in the U.S.in the current chaotic era. 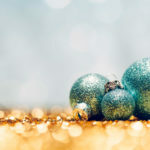 Even free, innocent, law-abiding members of the community are so frequently construed as guilty in the eyes of the public and the police forces, that it becomes a part of their identity. 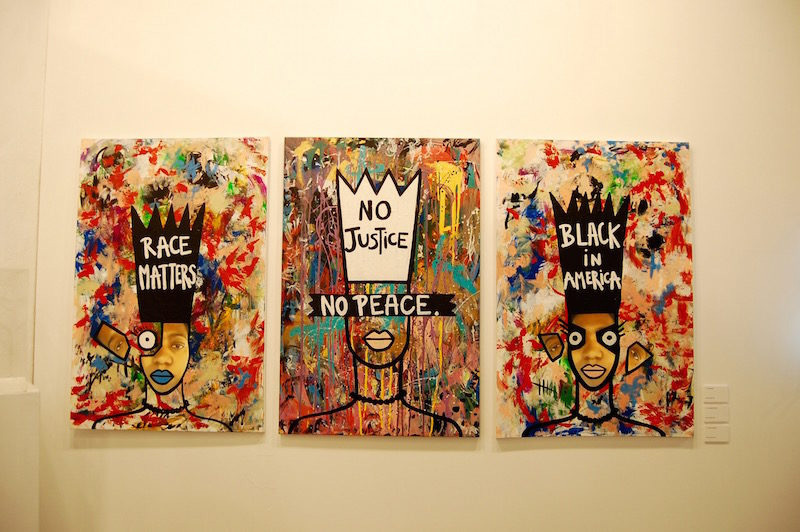 Artist American Queen TJD has created a series of inspiring paintings, each depicting the chaotic state of the Black community in the U.S. and incorporating impactful messages. 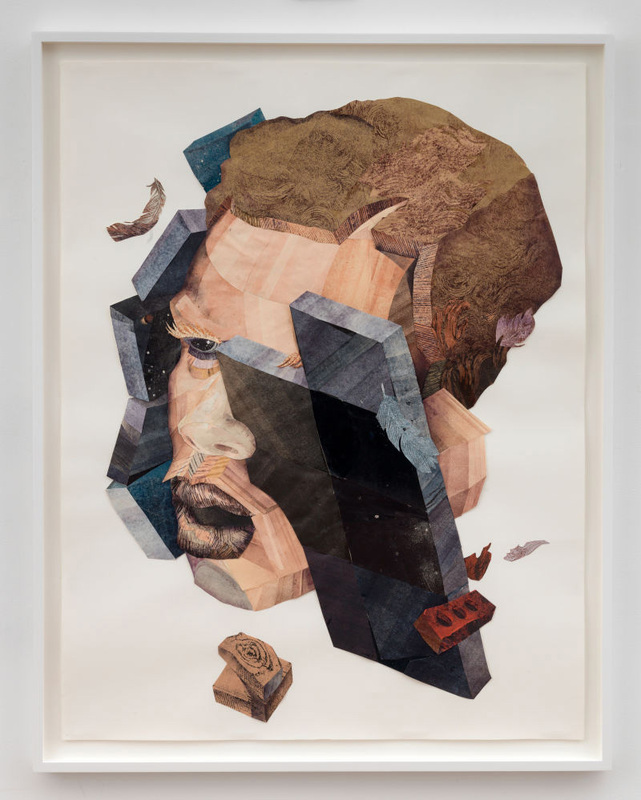 The kaleidoscope of conflicting colors and the disfigured crowned images embody an essential concept; empowering the Black community residing in America. Artists vary in their manner of drawing inspiration. For artist Curt Merlo, sitting quietly and deeply contemplating a subject matter for long time periods, much like a form of meditation, helps him in understanding the situation and the feelings that lie at the bottom of these issues. Merlo designed this illustration in 2015, when the murmuring regarding the rising black voices in America was all anybody talked about. Outrage and protests was wide spread, causing the Black Lives Matter movement to spread like wildfire. This illustration was an attempt to capture that excitement, the palpable energy, and the hope he heard in people’s voices. Black history Month also celebrates Black Economies and requests the government to support black businesses. This poster design by the artist Nikki Pressley features a professional design, with a neat layout, and a depiction of various Black businesses that are in need of funding. 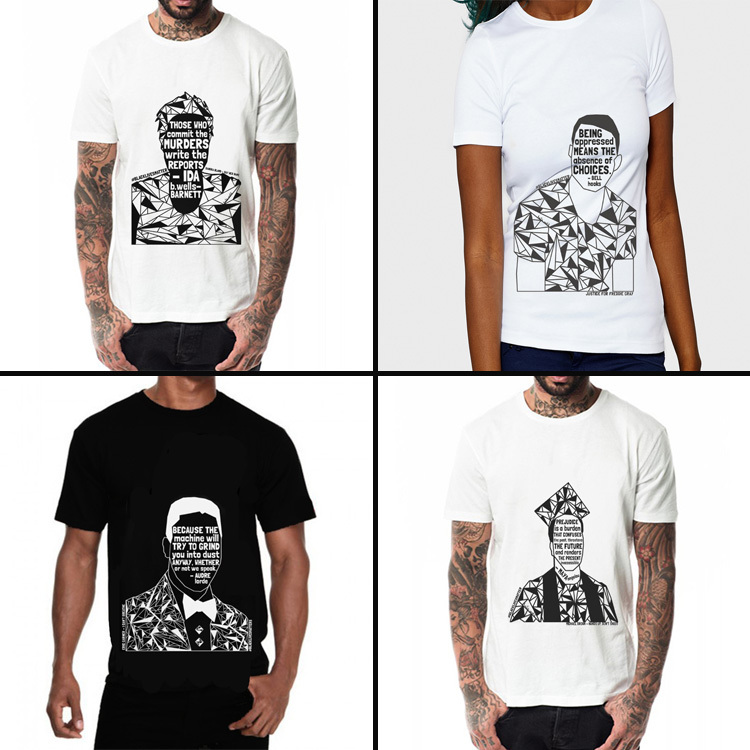 Katie Wohl’s range of T-shirts, titled “Black Lives Matter – Black Voices,” drew inspiration from the grief and frustration the artist experienced after Darrell Wilson of the Ferguson Police Department killed Michael Brown in cold blood. After decades of witnessing havoc wreaked on the black community by the vigilantes, security guards, and police officers, she realized that art has become an important outlet to contribute. Thus, she created art that might act as a therapeutic vehicle for herself, garner attention from those who remained blind to the institutional and structural issues of racism in America, and resonate with a larger community of people trying to play an active role in solving the problems of the society. All the proceeds from her spectacular collection go to the National Police Accountability Project. 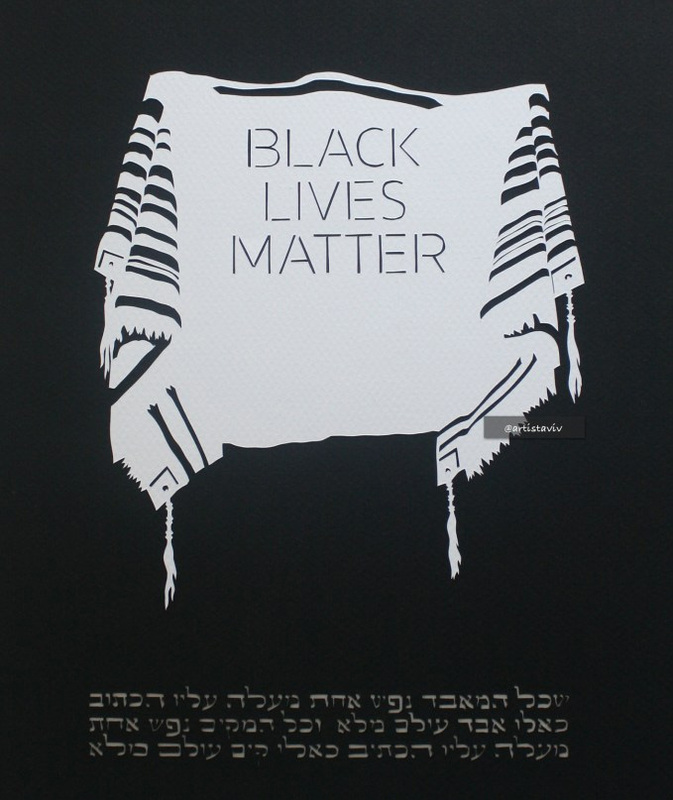 After the horrible week in July when Alton Sterling and Philando Castille were murdered in cold blood, Minnesota-based graphic designer, Aaron Hodge Greenberg Silver, crafted paper cut out of the slogan “Black Lives Matter” on an open Tallis, which people went crazy over. 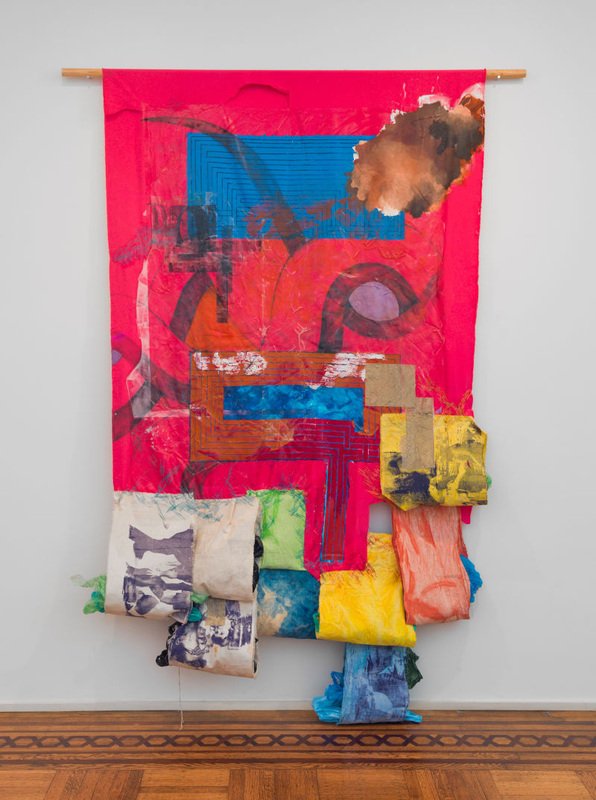 By wrapping the all-too-known text in a Jewish prayer shawl, to tie it to a central Judaism’s ethical tenets, the artist hints at the seriousness and the surreal gravity of the message. The black on white incisions are reminiscent of the apocryphal stories about how the Ten Commandments were carved completely through the stone or written on stone in black fire. This stunning work of craftsmanship is a powerful design element. 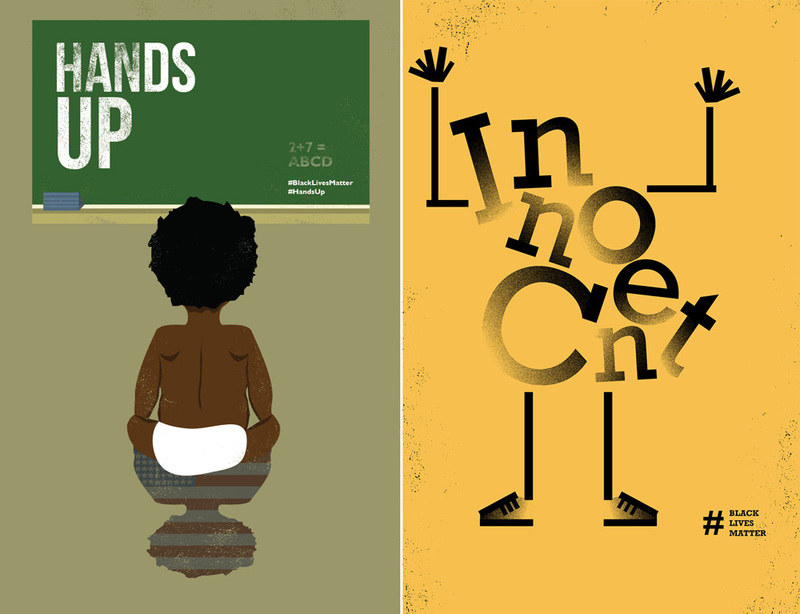 The impactful design by the artist Millisa Jackson, stresses the fact that the Black Community has rights and the right to be treated accordingly, through an illustration of black hands, inscribed over with the basic human rights; which by extension apply to the black community as well. 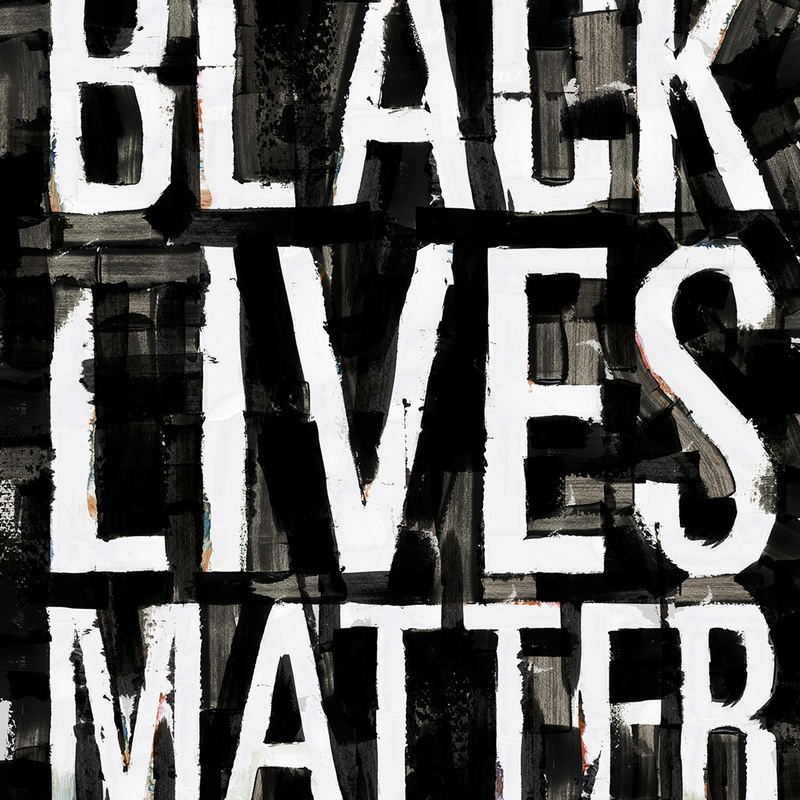 The artist has also designed T-shirts to support the #BlackLivesMatter campaign. The hand-lettered typography infuse the design with a humanly element, appealing to the emotions of the masses. 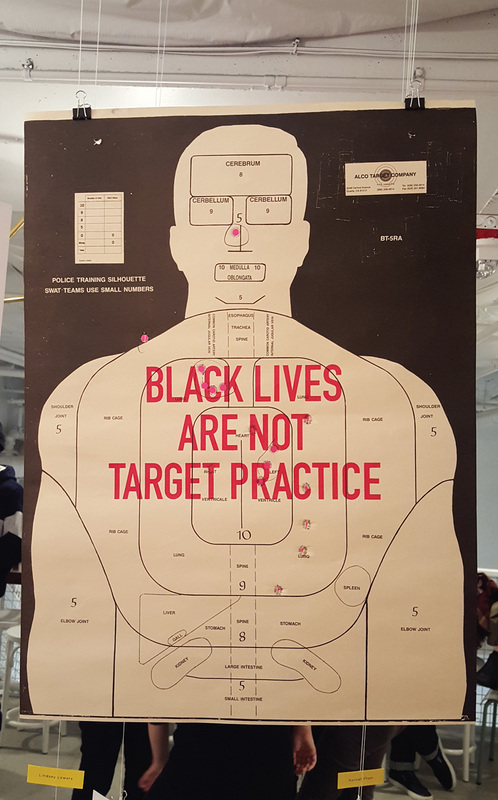 The amazingly creative design by the artist Lindsey Lewers, leverages a practicing board to stress the fact that it is by no means OK to murder an innocent Black person. 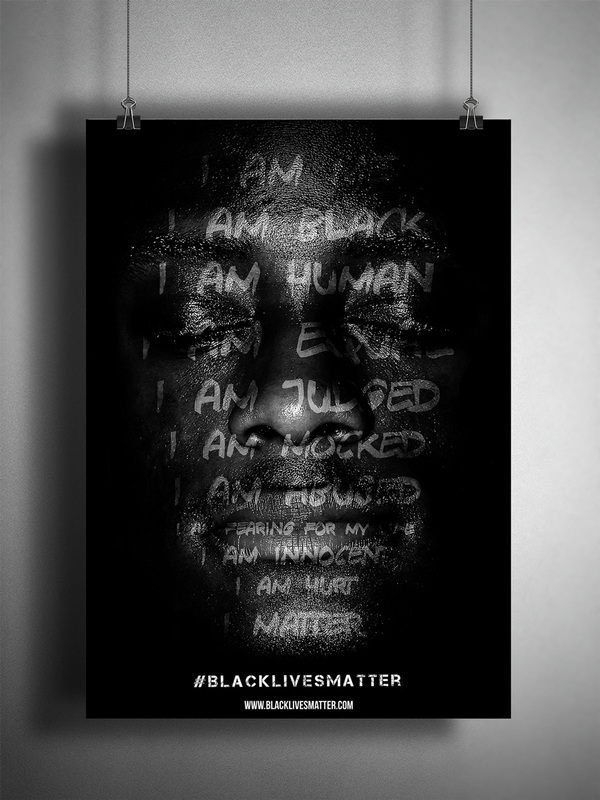 The artist Richie Aguilar has designed a series of impactful posters to remonstrate against the unlawful prejudice against the Black community of the U.S. and contribute towards the betterment of their condition. In one poster, an innocent little kid is being taught to keep his Hands up, written on the board next to his ABC’s. More potent in the image is the reflection of the small kid; a silhouette delineating the American Flag. All black individuals are patriotic citizens of America, and the murder of innocent people shall never be tolerated. Carson Ellis was so deeply affected by the decision of the Grand Jury that he sifted through the database of police killings that resulted in severe fatalities of unarmed African Americans. The artist chose 20 of them and read everything about them in order to illustrate them and commemorate their bravery. The stark reality of the killings made her confront some very hard truths about being white in America and being black in America. While she was never oblivious to the existence of racism in the U.S., she is now overwhelmed by the magnitude of it. 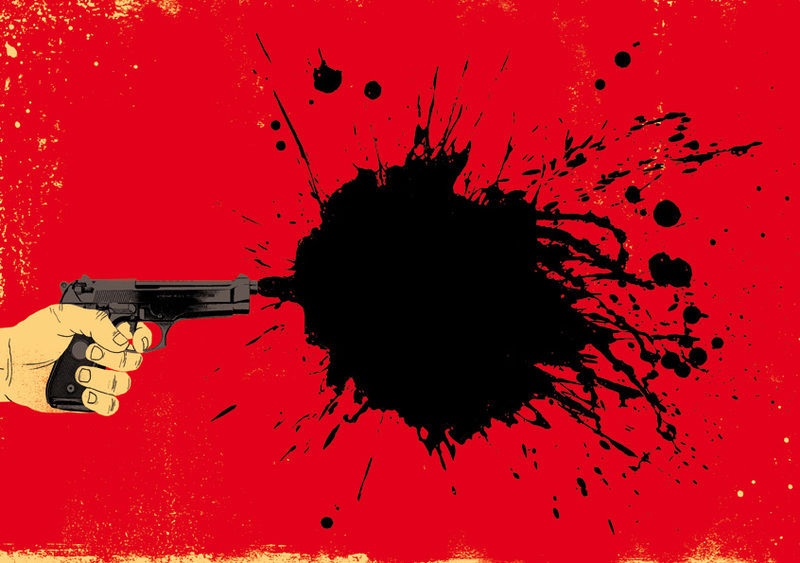 Artist Adrià Fruitós turned the bullet bursting forth from the weapon of a police officer as a symbol of fatal error and horror. Every bullet that bereaves a Black family is a symbol of shame and a stain upon the integrity of the laws of the country. Artwork created by the artist Yashua Klos is very personal to him. It drives from his experience as a black man and his incriminating racial identity. Growing up on the outskirts of Chicago, the artist has a knack for pulling imagery from his surroundings, such as streets and bricks from buildings, and leveraging them in his designs. 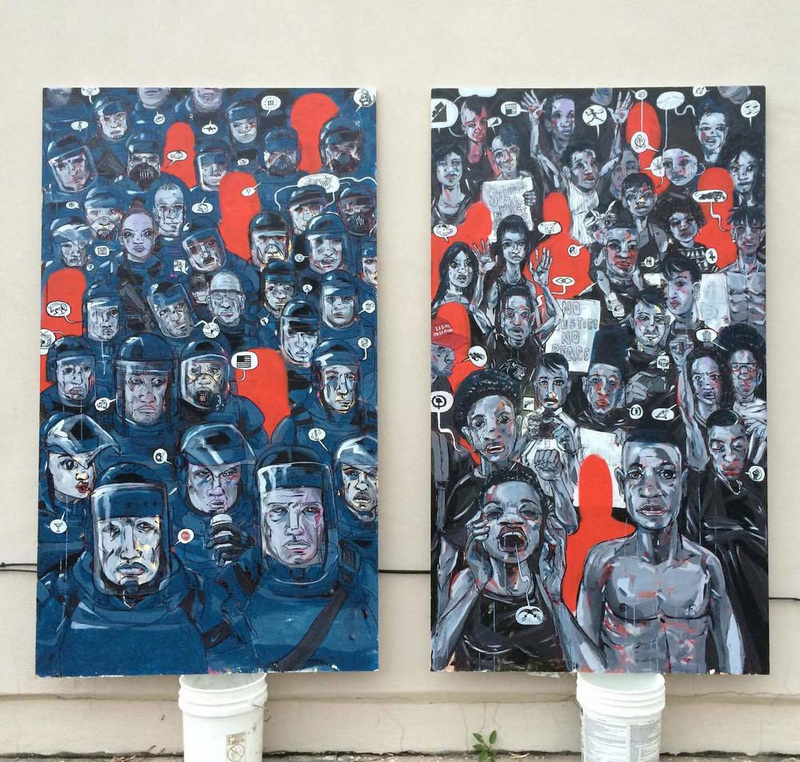 In his artwork above, the black male, police, and violence all come together to form a tableau. This amazing painting by the artist Lmponie is another in a great series he had been working on since the murder of Mike Brown. Being a street artist, he had been making work on paper and wheatpasting it on Brooklyn doorways. His paintings often bought him face to face with the people whose kids he had been painting, and he found a way to connect with those families. Historic design, it reminds me some of the memorable events in the history. Why the word “black”, it sounds kinda racism ? This is Yashua Klos. Thanks for the look on your site. One correction: I am not from the outskirts of Chicago. Im from the city of Chicago. South Side. Thanks again.